Even though the holidays are over and we’ve all settled into the New Year (whether that be at home, at school, or in a different country!!! ), I thought I’d bring back this blog with a little taste of my past. To be honest, the two-week transition from study abroad in Paris to my hometown of Doylestown, PA, to the crazy college life of Northwestern, has been a rough one. In Paris, I had all the time in the world to frolic around the city having silly three-hour candy adventures. At Northwestern, the word “frolicking” is so far from my vocabulary—try “sprinting” between my classes, meetings, the library, work (which is a whole other can of gummi worms), and whatever social life I manage to squeeze in. At times, I feel like I completely left my study abroad experiences in Paris when I boarded the plane for Washington, D.C. I feel like I’m missing a part of who I was. There’s only so much you can respond when someone says, “Tell me about your fall in Paris!” The best I can do is to say, “It was awesome!” and to point them in the direction of this blog and the entries I wrote in the fall. So, I was thinking … what better way to ease into my “new”/old/former/current life at school by writing a post about my hometown’s best candy store on my Parisian sweets blog? That was complicated, I know. But stick with me, because mouth-watering pictures of candy are comin’ up. 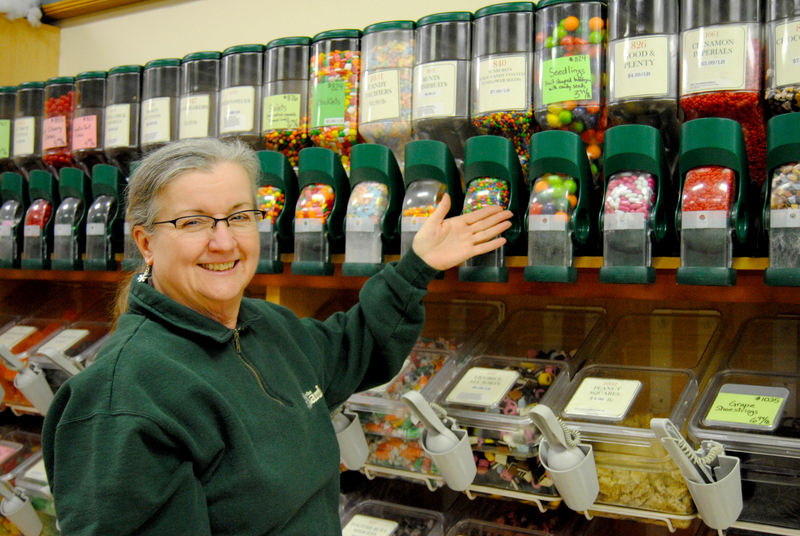 In my quaint little hometown of Doylestown, Pennsylvania, there’s one and only one candy store that caters to my candy needs: The Larder. Nestled in a tiny shopping center between a seafood restaurant and a Tae Kwon Do martial arts studio, The Larder isn’t just a candy store—it’s a gourmet and bulk foods store, which means that hundreds of big plastic bins with scoops or pull-down latches line the walls, and you can drop into a plastic baggie just as much (or as little) of food as you want. Each bin has a number, and you write the number on the bag’s tie so that the cashier can weigh the food appropriately. 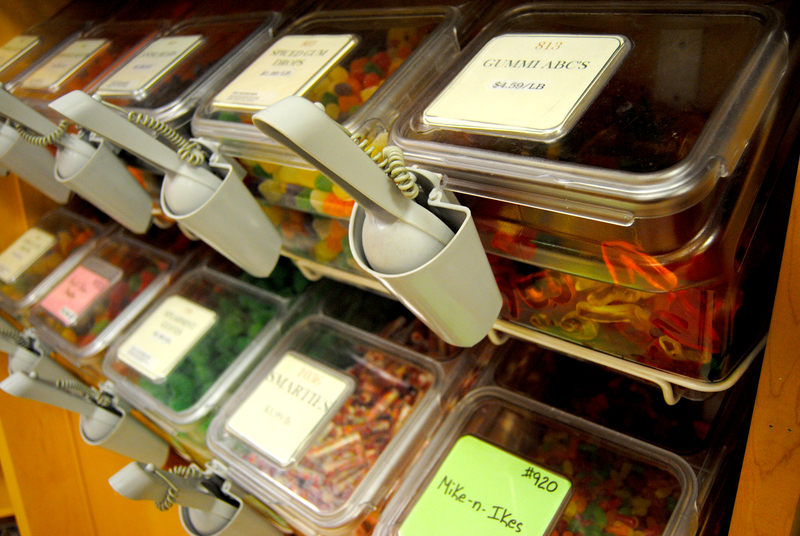 So, yeah, when I need my fix of chocolate-covered gummi bears or strawberry shoestring licorice, The Larder is definitely my number-one spot. But among the hundreds of different gummis, chocolate-covered anythings, gumdrops, hard candies, holiday candies, jelly beans, and gourmet chocolates, there are bins full of dried fruits, nuts, seeds, flours, sugars, pastas, grains, coffee beans, tea leaves, sprinkles, herbs, spices, trail mixes, pretzels, crackers, cookies, sugar-free candy, and other non-bulk items like cookie cutters, gluten-free products, gift baskets, locally-produced goods, and so many other things that I would type out if I wasn’t so exhausted from already typing this list!!! Now, I know what you’re probably thinking. “The Lard-er? Like, lard? Like, fat?” Oh-ho-ho. How silly you are! Let us proceed with an enormous, pain-inducing eye-roll on my end, and then a quick (and painless) etymology lesson. If you had been frequently brushing up on your Middle English vocabulary like I do each night before bed, you would have known that the word “larder” is a noun that refers to “a room or place where food is kept; pantry” or “a supply of food” (Thanks, Dictionary.com!). 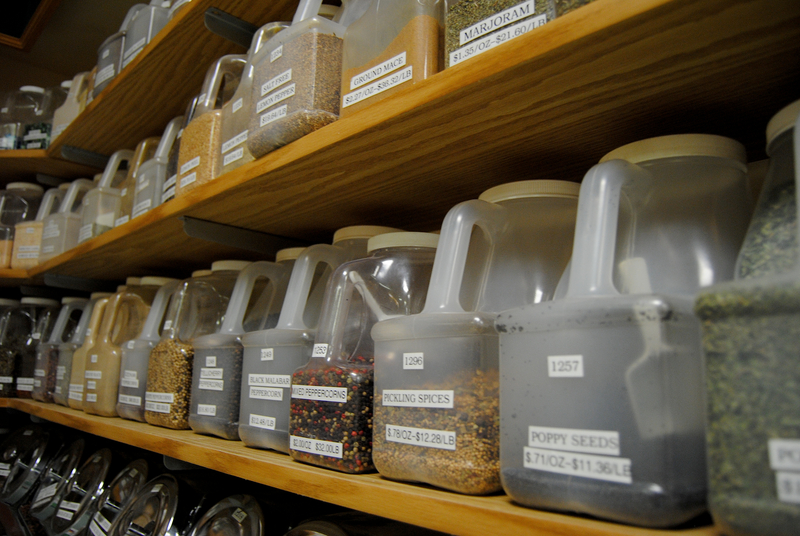 So, yes, eating copious amounts of this food may make you “lardy,” but this is one heck of a pantry if you ask me! 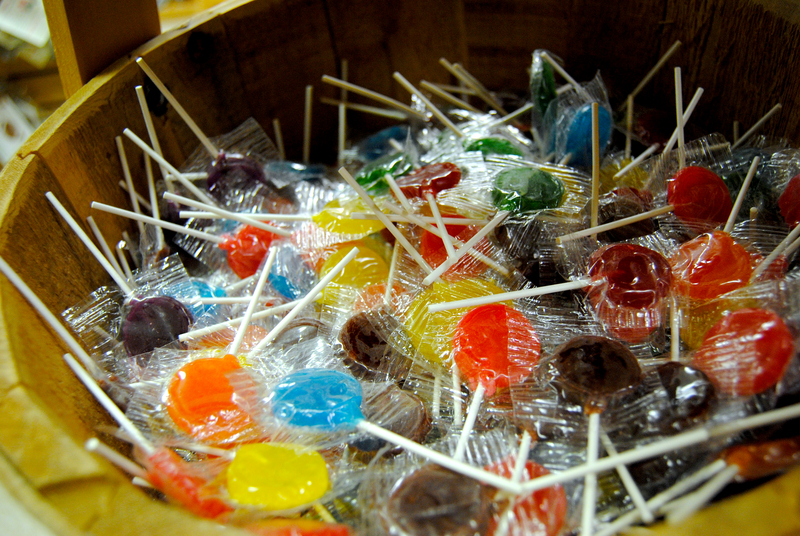 Lollipops of all shapes and sizes fill wooden buckets to the brim. Salt water taffy, peanut chews, starlight mints, Mary Janes, and other delicate delights you’ve probably never heard of before because they were from “your parents’ time” shine in overflowing baskets. Yet, although these candies have more of an “old tyme,” forgotten feel than your average Reese’s Cup, they are so incredibly familiar to me—and not just because I visited the store so many times as a child with my candy-loving father. I know almost every flavor and wrapper, every name and brand, and every square inch of this store because … well … I worked here. Since Thanksgiving of my sophomore year of high school until about the same time of my sophomore year in college, I donned a forest green work shirt with The Larder logo embroidered on the left breast and wore it with pride—weekdays from 3 to 6 and Saturdays from 10 to 5. I stocked every food bin, knew (almost) every bin’s number, and gave every customer a smile (even when they didn’t deserve it—I’m looking at you, soulless soccer mom chatting on her cellphone at the cash register). I talked to some pretty decrepit old men coming in for their weekly Australian licorice stash and even spoke gibberish with a babbling baby or two. And to top it all off, I spent five years surrounded by some of the most rare, worldly, comforting, and delicious food I’ve ever tasted. Not only did I eat the food, but I had to stock the food as well. One of my favorite foods to stock were the sprinkles because they were a challenge. 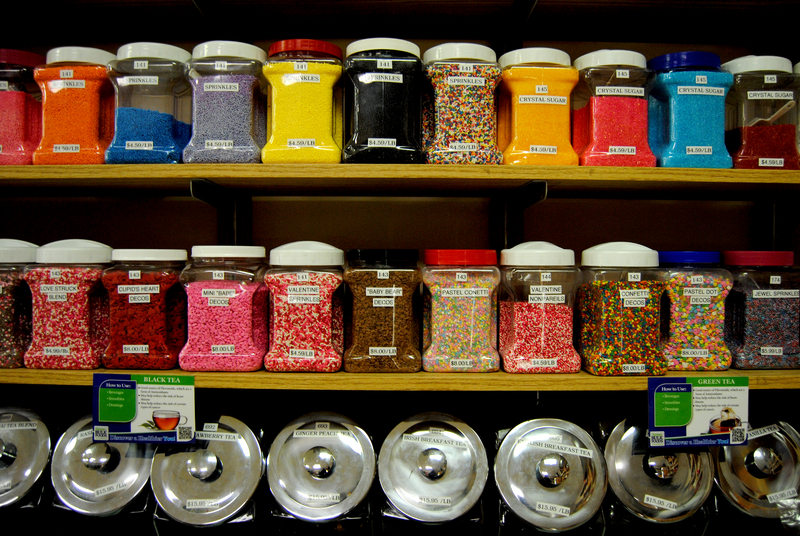 Sprinkles, jimmies, whatever you choose to call them, those little buggers could slip and slide so easily out of their scoops that any time I stepped away from the sprinkles counter there would be a new sugary mess waiting for me to sweep up when I returned. My least favorite food to stock? The spices. Ugggh. If you’re ever faced with a 25-lb box of hot chili powder, run as far away as you can. I’m serious. One scoop of that stuff would send a lethal cloud of spicy smoke into the air, and from that point on, my nose was a goner. I couldn’t stop sneezing for minutes after stocking that tub. 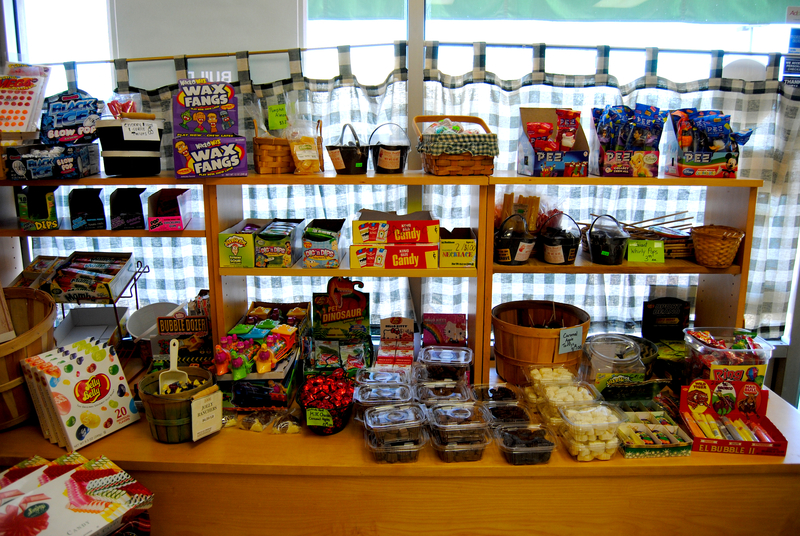 This decadent display greets you at the front counter when you went to pay for your treats. 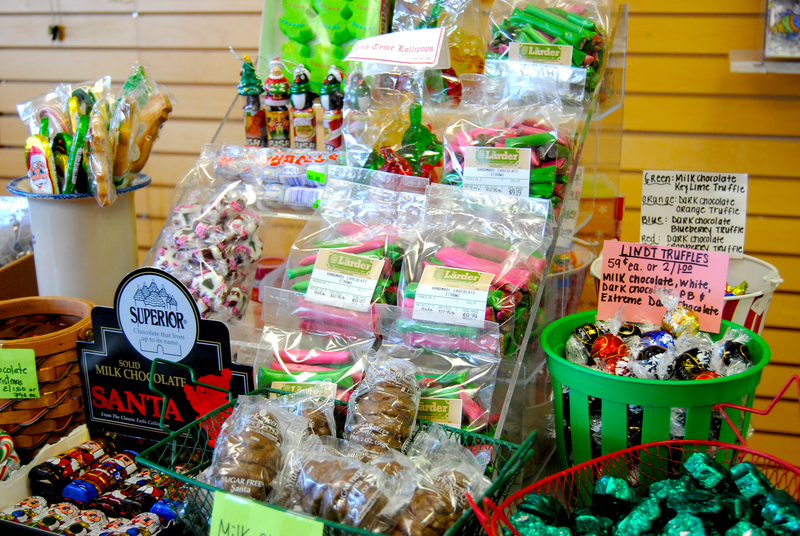 As if the rest of the store wasn’t tempting enough, there are foil-wrapped chocolate truffles, packages of ribbon candy, and some of the best caramels you can find in the States calling your name. When I walked into the store a few days after this past Christmas, this sign greeted me. The Larder has been in business for almost thirty years and has gotten its fair share of local awards, but it’s cool to know that a place like The Larder is still kickin’ big business booty with its family-owned, independent small-business, “Love Your Local” mantra. 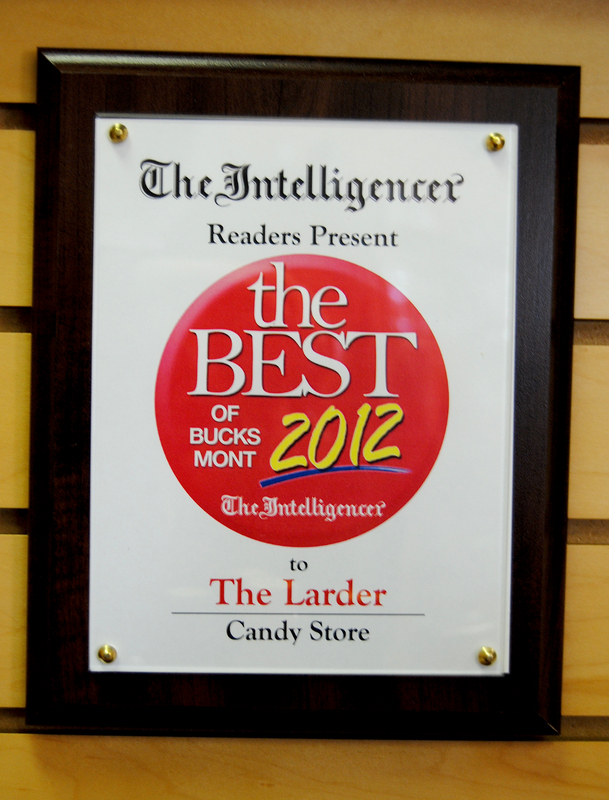 Congrats on being the Best Candy Store of 2012! And here is my boss and the owner of the Larder, Emily. Not only does this woman know her food, she knows how to run a business. I owe a lot to her—my love of candy (duh), an appreciation for quality food (no more Hershey’s for me! ), and the capability to smile no matter the situation, even if it warrants an eye roll (because that’s what the back room is for). If I can own a business that meaningfully touches even a fraction of the amount of people like Emily and The Larder do, I’ll be really lucky. So if you’re ever in or around Doylestown, Pennsylvania, for goodness sakes: stop by The Larder. After working there for five years, there are times when even I see something new and different on the shelf that I’ve never seen before. There’s definitely some weird stuff (candied violet petals? what!?!) and some old favorites (chocolate-covered pretzels, Jelly Bellies, even Hershey’s Bars because, whatever, I guess they’re an American symbol). But no matter what you pick up, it’s gonna be delicious. When I visited this past winter break, I picked up a few of my favorites: almond buttercrunch, assorted shoestrings, and a caramel or two. I had intended to bring a stash to school, but let’s be honest—they barely made the car ride home from the store. But even now, sitting in my bed in Evanston, IL, a thousand miles away from the Larder and thousands more from “Paree” … writing this post gives me enough of a sugar rush. Because no matter how old I am or which state (or country) I live in, a little candy from The Larder will always bring me back home. Almond buttercrunch. Do not leave without at least one or two pieces. 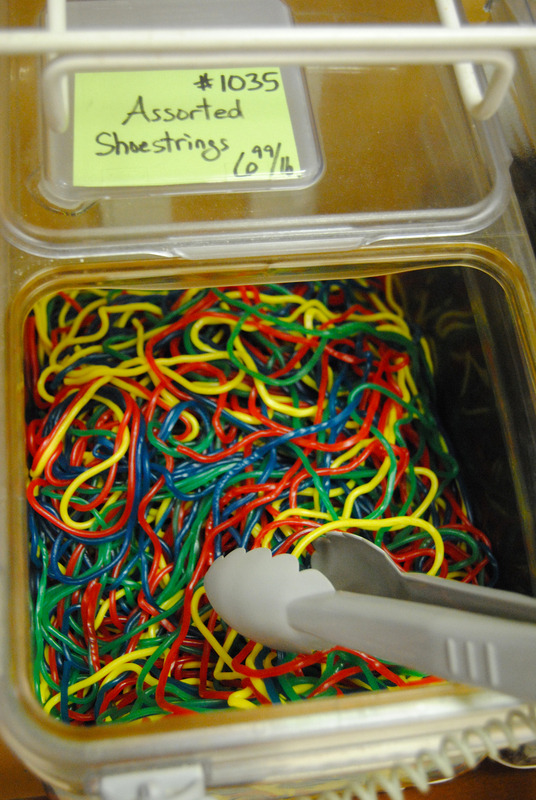 Assorted shoestrings. Just look at the last picture. Need I say more? Béquet caramels. 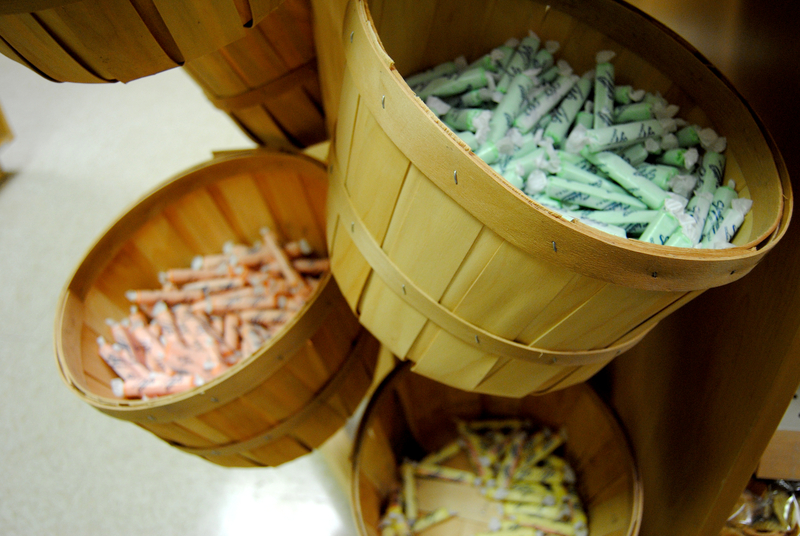 Flavors include but are not limited to sea salt, chocolate, and chipotle. As far as American caramels go, these almost rival the French. Chocolate-covered gummi bears. Don’t bash them ’til you try them! Freshly-ground peanut, almond, and cashew butter. None of that sugary JIF crap. Tags: baking supplies, business, candy, caramel, chocolate, coffee, cookies, doylestown, family owned, herbs, hershey's, home, lard, larder, licorice, lollipop, nuts, paris, peanut, pennsylvania, small business, spices, sprinkles, store, sugar-free, taffy, tea, the larder. Bookmark the permalink.